We have devised an instrument that can be used to train the ankle dorsiflexor muscles (they bend the toes upward) of mice and rats by repeated electrical stimulation, to measure the contractile torque, and to stretch the muscles simultaneously to cause an “eccentric contraction” which leads to a slight injury. The extent of the injury can be controlled by adjusting the speed and extent of lengthening, and the number of repetitions. The platform on which the animal is placed is shown above. 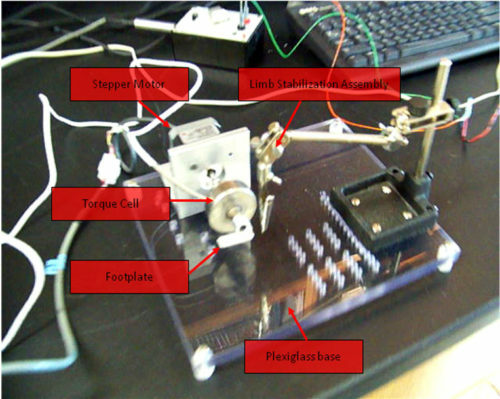 This instrument, which we call “SUMITT” for “Small Animal Unit for Muscle Injury, Muscle Testing and Muscle Training In Vivo”, has been submitted for patent protection. We have used it extensively to study the similarities and differences in response of healthy and dystrophic muscles to eccentric injuries in living animals. We have also adapted published methods to induce injury to isolated muscle fibers in vitro by brief hypoosmotic shock. Cultured myofibers are exposed to ~1/2 isotonic buffer for 30 sec, then returned to isotonic conditions and assayed over time thereafter. Ca2+ is dysregulated after shock in dystrophic fibers, and in dysferlin-null fibers the transverse tubules are disrupted. The figure below shows irregularities in the t-tubules (in yellow pseudocolor) in dysferlin-null fibers before and after shock. We are using this in vitro injury to assay drugs and proteins for their ability to improve the phenotype of dysferlinopathic muscle.